TV: Teaching kids to vandalize sidewalks since 1957! 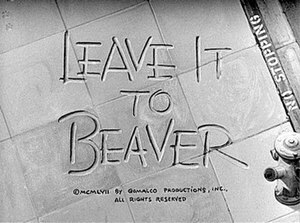 When I was a kid, some of my favorite shows went off the air before I was even born: Gilligan’s Island, The Addams Family, Leave It to Beaver, The Brady Bunch. Not only were there fewer channels on the television, but the channels that did exist had a much smaller back catalog of shows they could show. The two superstations on our local cable — WGN out of Chicago and TBS out of Atlanta — showed these old sitcoms on regular rotation. Since there are now hundreds of channels, and a seemingly endless supply of new shows to choose from, I worried that my kids would be deprived of “vintage” programming as they developed their own tastes. I shouldn’t have worried. Through Netflix, they’ve discovered plenty of classic shows — well, “classic” shows anyway. My 7- and 4-year-olds are currently obsessed with Mighty Morphin Power Rangers, but I have introduced them to The Addams Family, Leave It to Beaver, and even newer programs like The Cosby Show. And they don’t have to suffer through any Cubs games to get to the good stuff. This entry was posted in Television and tagged Netflix, TBS, WGN-TV by mhick255. Bookmark the permalink.